Photo by Atsushi Nishijima ©2014 Paramount Pictures. All Rights Reserved. Photo ©2014 Paramount Pictures. All Rights Reserved. 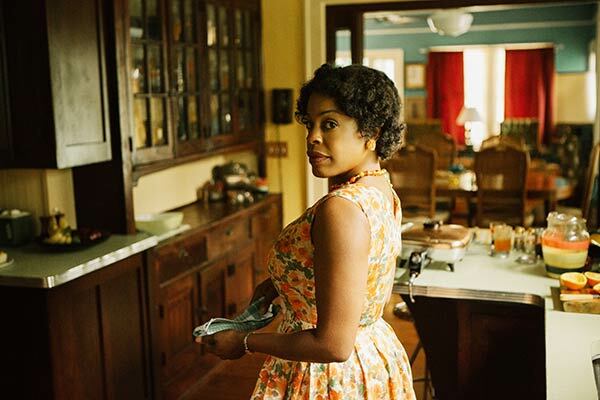 “Coretta would have had the best and latest appliances,” notes Set Decorator Elizabeth Keenan SDSA, i.e. the yellow mini-television. The intercom represents the need for safety in the midst of the continual threats the Kings received. In spring of 1965, a series of dramatic events changed the course of America and the modern concept of civil rights forever as courageous marchers, led by Dr. Martin Luther King Jr., attempted three times to carry out a peaceful procession from Selma, Alabama to Montgomery, Alabama on a quest for the basic human right to vote. The shocking confrontations, the triumphant final march and the passage of the 1965 Voting Rights Act that followed are now an indelible part of history. 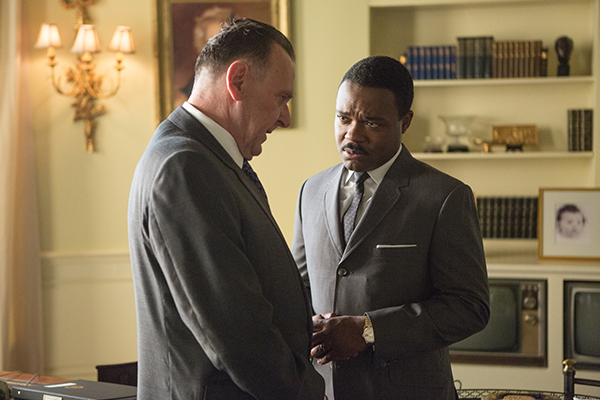 SELMA chronicles a string of astonishing historical details, large and small, including the intense relationship between Dr. King [David Oyelowo] and President Lyndon Johnson [Tom Wilkinson], the troubling involvement of the FBI and the unbreakable spirit of ordinary men and women who sacrificed and united around voting rights. What emerged from these stark details is a vivid tapestry of an American turning point in the making and the stirring journey of a man finding his way through doubts and daunting obstacles towards not just leadership but the togetherness required to make real change in the world. 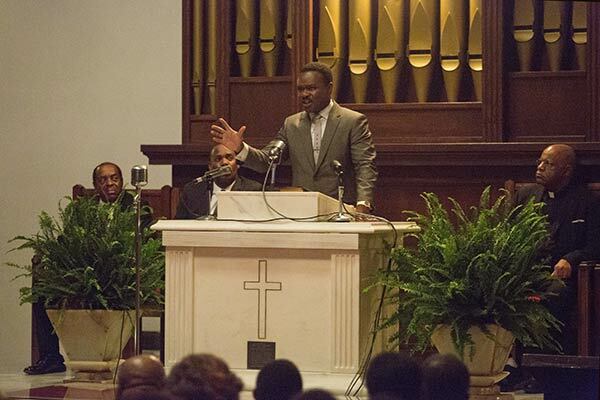 “SELMA is a story about voice - the voice of a great leader; the voice of a community that triumphs despite turmoil; and the voice of a nation striving to grow into a better society. 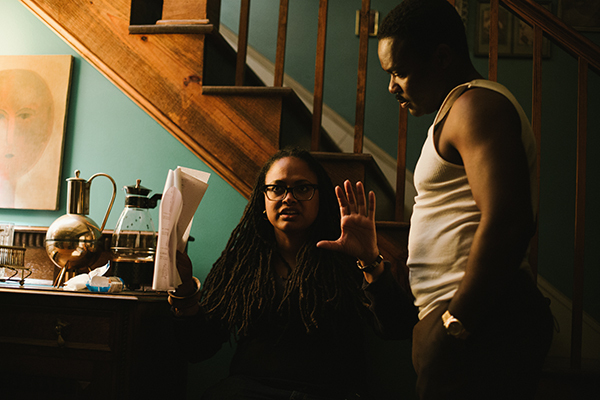 I hope the film reminds us that all voices are valuable and worthy of being heard,” says Director Ava DuVernay. SET DECOR: Making this film must have been a profound experience! Set Decorator Elizabeth Keenan SDSA: Yes, everyone on this film knew we were working on something special…an important piece of history, a great script, an untold point of view, with super-talented, interesting people. And working with Mark Friedberg was a real game changer for me. EK: The Alabama film commission in Montgomery couldn’t have been more welcoming or helpful. The mayor of Selma, George Patrick Evans, even drove us around town on a private tour. During a scout lunch of fried pickles, okra, etc. at Selma’s Side Porch Sandwiches, a lady from the Chamber of Commerce walked up to our table and announced that she was adamant we not make a mockery of their city. A prior feature had been shot in Selma, leaving people with a bad taste for future film projects, so they were understandably trepidacious. But Ava’s mother actually worked in Selma and her father was raised in near-by Lowndes County, so they knew she was the real deal. SET DECOR: How did it feel to be re-creating their story in their places? EK: We knew we were guests “on hallowed ground,” as Ava says. This was a once-in-a-lifetime experience and we owed it to the people of Selma to portray their story with reverence and dignity. We had come in from LA and NYC, big dog-eat-dog cities. Going down to a small Alabama community that was somewhat a naïve time capsule enervated a quiet respect and humility on our part. Walking into the actual Brown Chapel and seeing that light-bulb cross over the pulpit, where not only MLK , but Malcolm X and, later, President Obama had spoken, was chilling. SET DECOR: Did you talk with, work with many locals? EK: We talked with loads of Selma locals as we were dressing their downtown. Many had actually walked in or witnessed the original marches and of course everybody wanted to know when Oprah and Brad Pitt were coming. People brought us home baked goods and were generous in letting us borrow or rent items of interest. The Selma Museum was especially helpful for props. SET DECOR: This was a re-creation of a specific time, and real people’s homes, churches, restaurants, community. Did you try to exactly match what is shown in photos from your research, or did you focus on giving the overall feeling and filled in with details that would convey the essence of each place? EK: As 95% of the sets were locations we tried to capture the essence of the time period while getting very close to certain important elements. 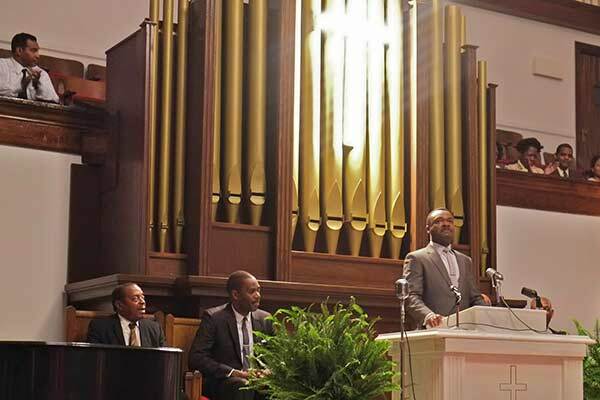 The organ pipes and the light-bulb cross that hang behind the pulpit at Brown Chapel is one instance. 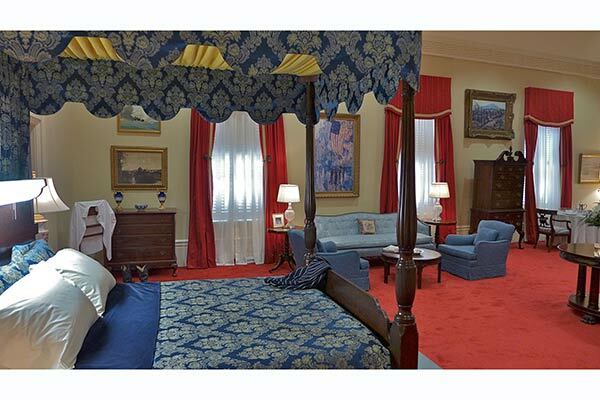 Items in LBJ’s Oval Office, one of the few sets built onstage, were fairly close replicas: the triple TV console, drapery, and that gigan-tor rocking chair with unusual footrest, upholstered by Andre Pierre in Atlanta were super close replicas. Dressing from Omega Cinema Props, Warner Bros., History for Hire, and Faux Library in Los Angles also helped get that set period accurate. Obviously, there was an emphasis on the set decoration! EK: Mark’s point is well taken, as this film is a much more intimate portrait of people’s lives that required greater attention to time and place to help make the story believable. With all period films, even the tiniest incorrect detail can distract an audience, and with a historical film it’s even more critical, so getting all the obvious stuff: electronics, televisions, telephones, speaker boxes accurate was definitively important and a launching point for more interesting ideas. 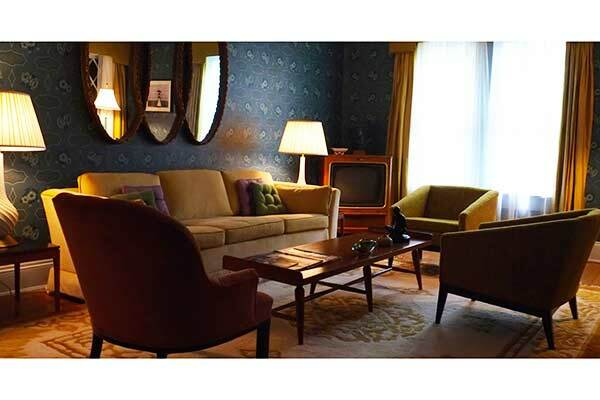 It seems more and more films and commercials are shot on locations with fewer and fewer builds, thus creating huge pressure for set decorators. That is certainly true of this film, however, Mark found great locations that lent themselves to multiple sets. Atlanta’s Wheat Street Church was home to not only five of the Brown Chapel sets, but also the NY diner, Luizzo’s Detroit apartment, Reeb’s Chapel in Boston, the Birmingham church bombing stairwell, and a meeting room depicting the infancy of the Black Panthers which was ultimately cut from the film. EK: As you pointed out, that translates to a big emphasis on set dec.
Then with our character sets, we used a rich, saturated, very warm palette, alive with patterns and contrast, pulling color through the sets for a cohesive look. In early 2014, Mark attended the Brooklyn Museum exhibition, Witness: Art and Civil Rights in the Sixties. The catalogue from that show inspired the color palette for Selma. Electric, saturated, warm colors from Benny Andrews, Romare Bearden, Robert Indiana, Jae Jarrell and more would inform our big character sets. Bradford Young, our DP, really wanted to differentiate the sets through the use of lighting. The Establishment sets would have a colder, hard florescent light, while the sets of our main characters would be lit from practicals with 250watt bulbs emphasizing the “fire within” and inner passion. We spent lots of time and effort on stand-by lampshade options and provided the camera and electrical departments with extra practicals and shades that they could customize to suit their needs. SET DECOR: What was your process? EK: Like any decorator I started with overall themes and conceptual direction for each set and then just got tighter and tighter with the details. We were moving VERY fast but the overall note was…if it fits our time period, looks great, and has our personality Buy It. We’ll figure out where it goes later. Color, texture, and personality were paramount. We put in colossal hours prepping this film. Who doesn’t? All the sets needed to be sourced and decided upon prior to shooting as there would be NO TIME once initial photography commenced. Naturally smaller scale dressing flowed in as necessary but my department was in overdrive for 90% of the film. About 4 weeks in, we had a sit-down with Ava and reviewed dressing for most of the bigger sets and important character sets, ie: the King and Jackson homes. We made most of our decisions at that meeting and I understood where we needed to go and what holes needed to be filled. There was a trust that developed and I just did my thing. We always finished dressing sets a few days prior to shooting so she could make comments; that allowed us time to respond with changes if necessary. Wendy Weaver helped me pull a huge order together from LA and we shipped it to Atlanta. 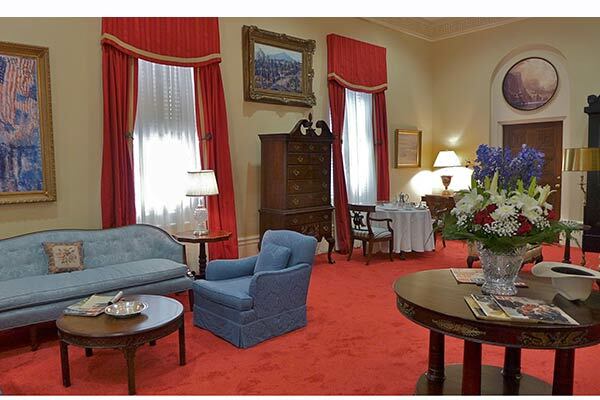 As mentioned earlier, Omega, WB, H4H and Faux provided most of the dressing for the Whitehouse: Oval Office, LBJ Bedroom, Corridor…and for Wallace’s office. 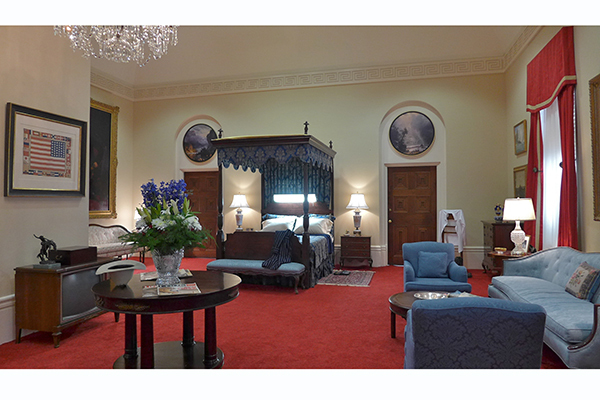 We had lots of existing research for the Whitehouse interiors, i.e. 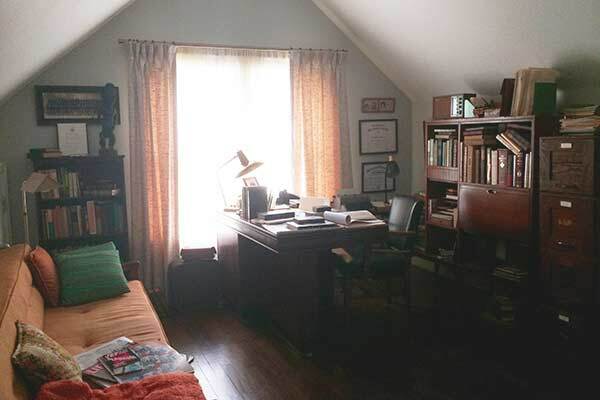 Johnson had a florescent light attached to his headboard, as he did work in bed and held meetings from bed as well. 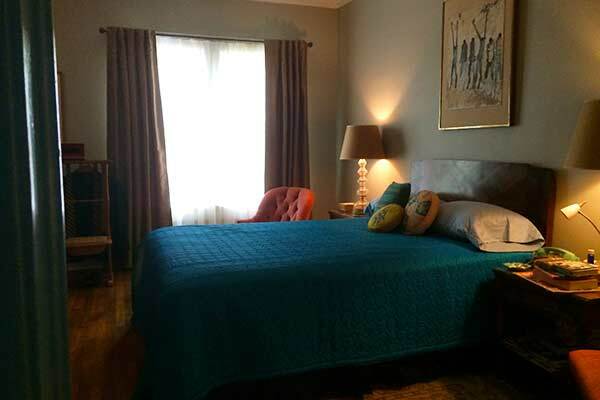 We installed electric red carpet to vibrate off the blue sofas and bed dressing. Getting those huge sets sussed-out early allowed me time to focus on character details for the other sets. EK: The civil rights movement has been heavily documented so there were LOADS of resources to draw from, and, of course, Mark had researched it heavily. We got hold of some rare television footage of MLK at home with Coretta and the kids and that really informed the tone of their house. For me personally, photographers Bruce Davidson and Stephen Somerstein captured an innocence and poignancy that I continually drew from. 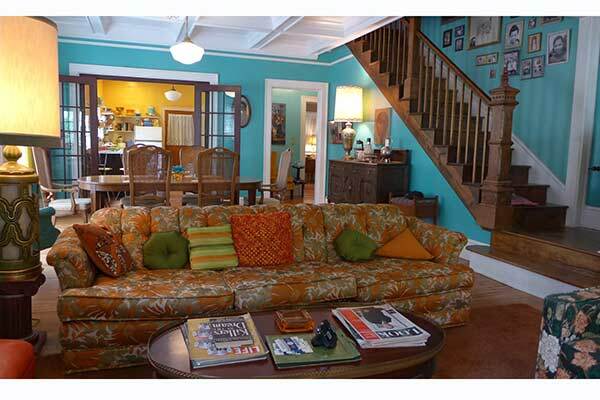 SET DECOR: Speaking of research, were you able to go into the home of Dr. Sullivan and Richie Jean Sherrod Jackson? 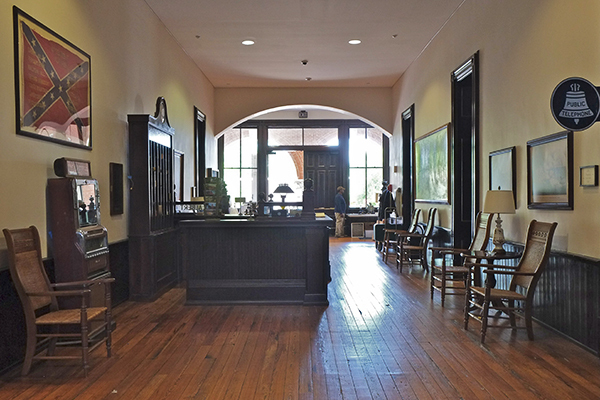 EK: One of our stops on the Mayor’s tour of Selma included a visit to their original home. THAT was amazing as so much happened under that roof! We were all moved to tears. 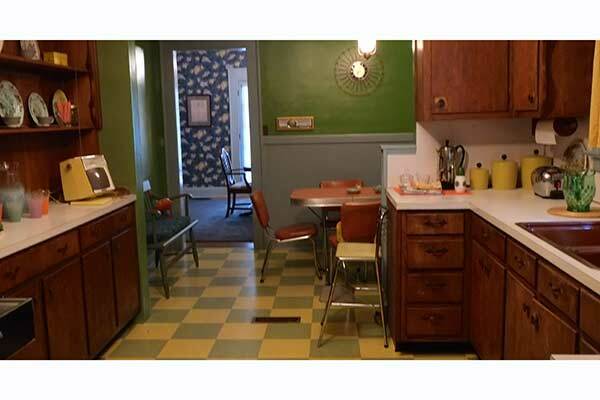 The color schemes, mixed patterns, and especially her kitchen…the hub of that house informed a lot of details we would later use. You could really feel the energy in that house. 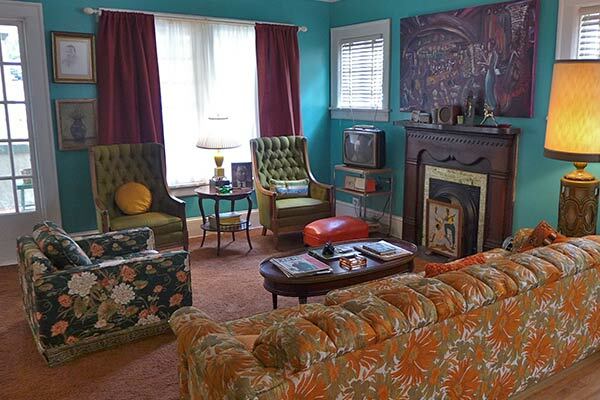 The Jackson home also needed to convey Richie Jean’s nurturing personality…lots of family photos including historical family portraits, loads of art, needle-work projects, a large kitchen with nicer appliances, big furniture – tall chairs, long couch. 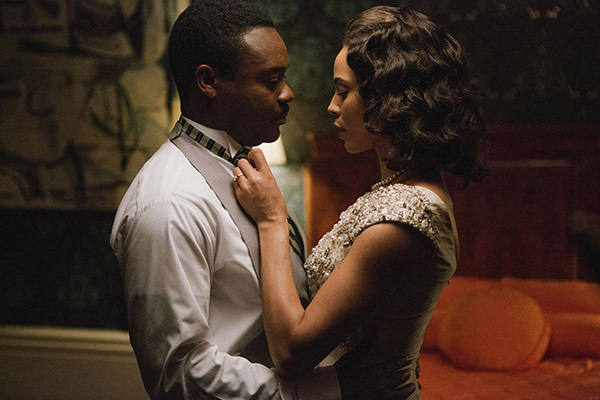 It also needed to be a place that King wanted to slip away to…away from Atlanta…and away from Coretta. SET DECOR: Did you get director’s notes on this one? Many changes? “First off. Stellar work. But you're used to hearing that by now. It's more than I ever envisioned Richie Jean's house to be - in the very best way. That kitchen. 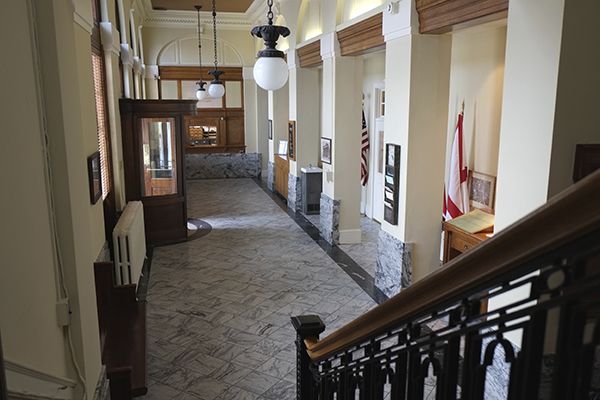 The extended counter. The doors. The stools! The perfect pictures on the walls of her ancestors and forebearers. The shammy cover for the toilet like my Grandma has! The crocheted things all around, made with love by Richie's own hands. Those great twin beds with the sweet sewing machine. The view of and from Sully's desk, perfect. Those medical file cabinets, not overwhelming, perfect size! And that comfy, functional, colorful living room - from the couches to the lamps, all leading to that pride of ownership dining room set. But let me go back to that kitchen. Again, pretty incredible. All the decisions to move and remove and reshape it were exceptionally done. I wouldn't change a thing. EK: Coretta really identified with Jackie Kennedy. She was very well educated, having won scholarships for music, and was a trained opera singer. He really married ‘up’ when they got together. The important thing about that house is that it was rented. They didn’t own a house for a long time, so it needed to be less layered than the Jackson home. They purposefully lived beneath their education status and wanted to avoid being too ‘showy’. 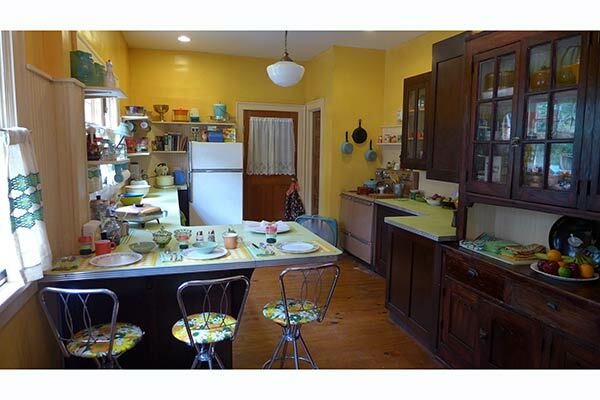 The set reflects the fact that she was often alone raising four kids by herself while her husband was on the road at meetings, speaking, organizing, etc., therefore the house was a bit more feminine in tone. I found those intercoms (there were two – the other in the children’s bedroom and thought they were an important note in reaffirming a small notion of safety under the stress of the constant threats the King family endured. Although the Kings didn’t own their home, Coretta would have had the best and latest appliances. That’s the rationale for that little yellow TV, and the amazing pull-out compact stove that didn’t make the final cut of the film. 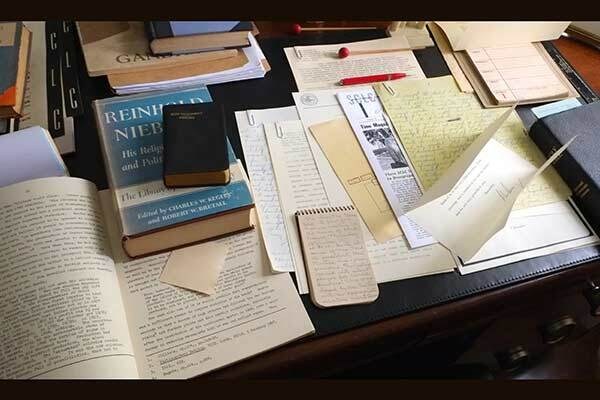 The fact that he studied so much philosophy really informed his library and lots of speech drafts and personal correspondence covered the top of his desk. King was the first president of the SCLC (Southern Christian Leadership Conference), so there were always newsletters to edit, research to do, etc. After Coretta questions Martin about other women he later walks down the hallway to check on his sleeping family. The kids needed to all sleep in the same room for quick storytelling, but more importantly for the idea of safety as previously mentioned. The half-shutters with dotted-Swiss inserts ensured privacy while allowing light to enter. 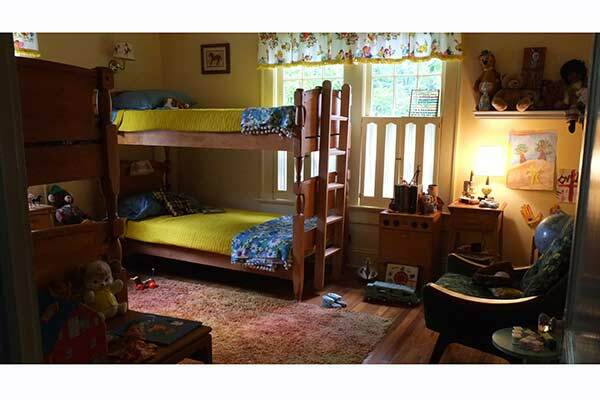 Those twin bunks came from Bob Meek’s Prop House. Not only was Bob an amazing resource, but a great guy who saved us on many occasions. 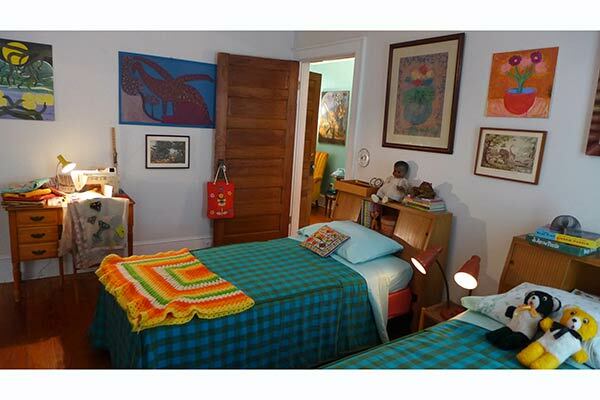 There were four matching bedspreads in 2 color ways, blue-green and pink-tangerine for the 2 sons and 2 daughters, purchased at Cobb Antique Mall and eBay. All the toys were locally sourced or from EBay/Etsy. I paid a rather outrageous sum for a genuine 1964 African American Drowsy Doll. I had a blonde one when I was a kid and loved it...the eyes were half open like she was about to pass out and she had a talking pull-cord. 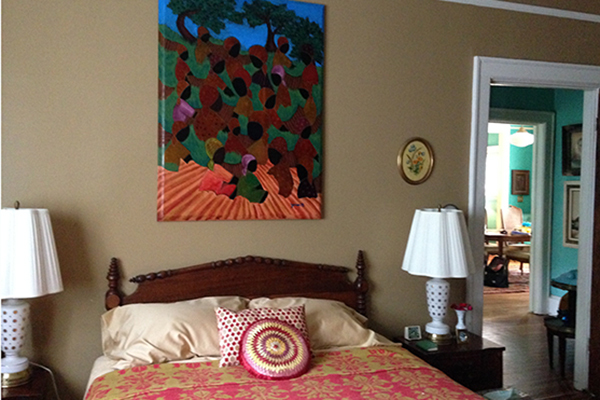 A simple affair without too grand a headboard…we really had to pull back in their room. 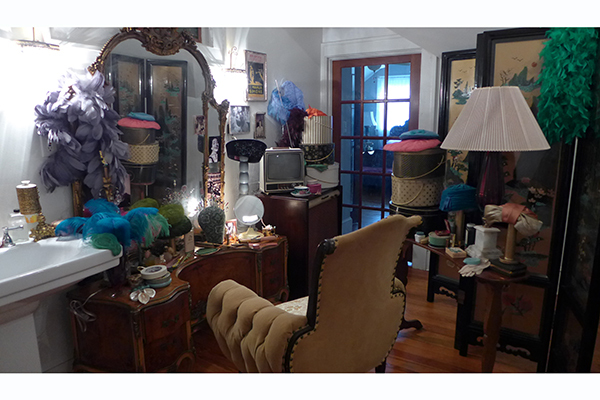 She read a lot, so there were piles of the appropriate books next to her side of the bed, and all the right notes on her dresser: Shrimp-Frost lipstick, pearls, Chanel #5, clip earrings, scarves, gloves, etc. The dining room was a close approximation to our research, we tried to match that wallpaper and suite of furniture as closely as possible. 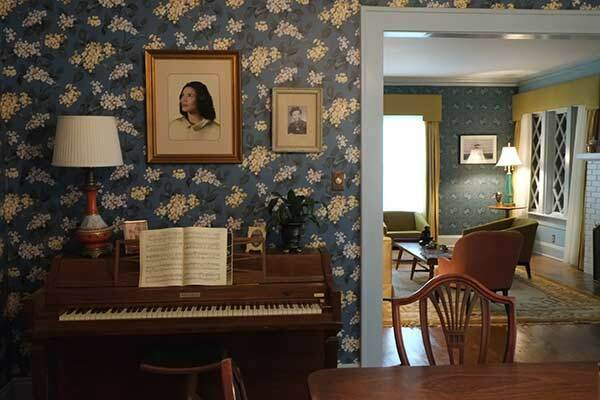 We put a piano in the dining room, as so much music happened in that house. The living room was minimal and calm. 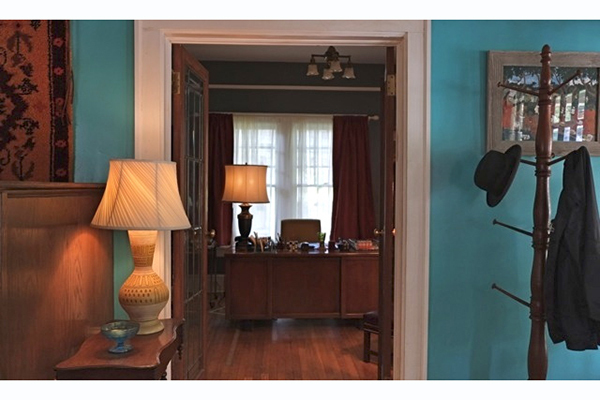 The furniture got rearranged for that scene…you can’t be on set all the time. 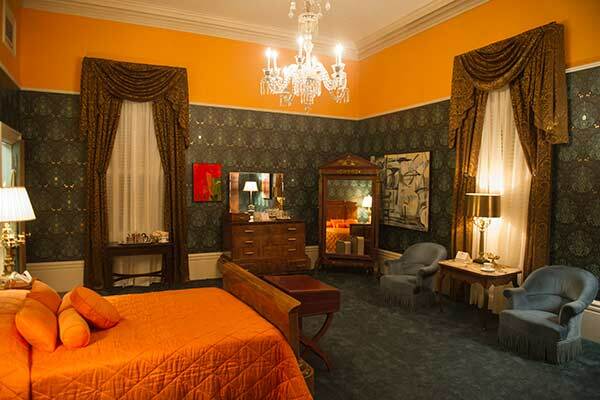 The silk valances and drapery for both rooms were created to match our research and that aquamarine lamp next to the tape recorder was another feminine note as mentioned previously. 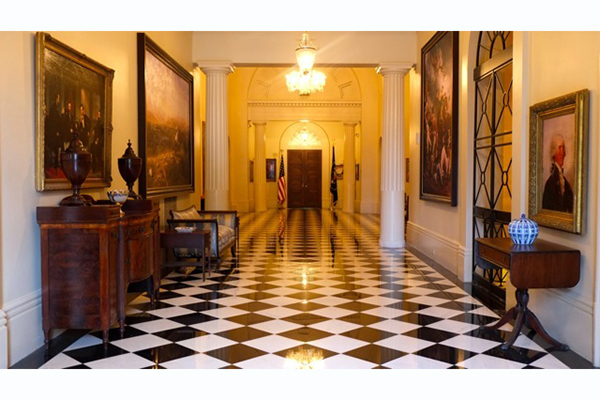 The original, mint condition ivory and gold rug came from a private collector. SET DECOR: You must have had great feedback on the King house sets as well. Bearden’s art really captures a raw intensity and he happens to be one of Mark’s favorite artists. The Bearden estate was generous enough to offer us a great discount on the rights to use several of his paintings for the King house. We really focused on family portraits and ancestral images for that set…lots of history and layers. 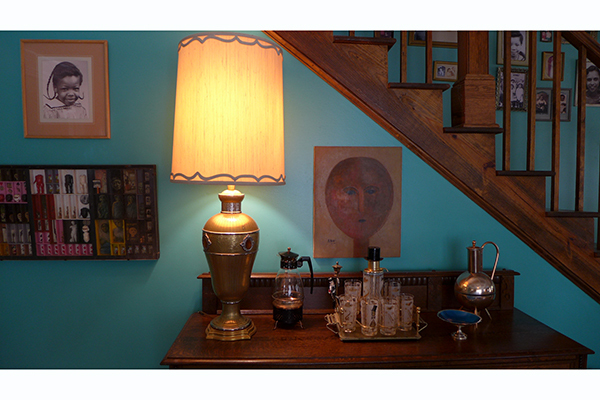 Loads of outsider art and paintings belonging to Mark’s grandmother, who had been a painter. Julia Heymans, my assistant set decorator, sourced so many great local artists and collections of outsider art that really enhanced the authenticity of the sets. Her tenacity helped me enormously, as the art was a huge character in these sets. King studied philosophy as much as theology and one of his great heroes was Gandhi. 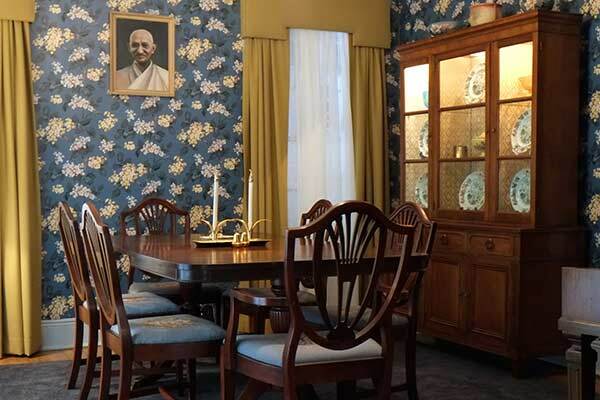 We matched historical reference in three locations in the King house: the dining room had a portrait of Gandhi over the dining table, we had another sculpture created to match a piece in his living room, and there was another portrait up in his home office. 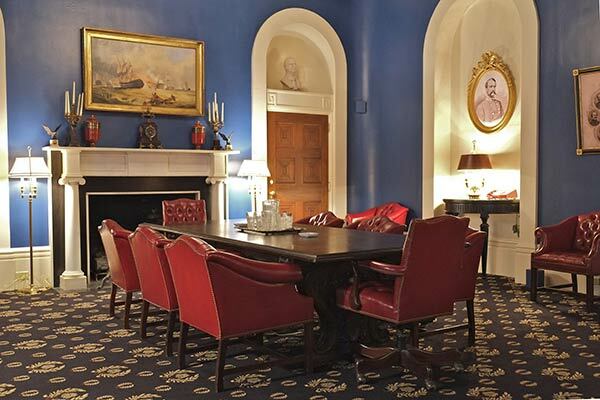 There are many framed photographs in his office of the march on Washington, a framed invitation from the White House, his diplomas, and antique textiles and a sculpture from his trip to Ghana. We used a lot of cleared art from WB and the National Portrait Gallery—we paid to download hi-res scans and printed them onto canvas then had them glazed by the scenics. 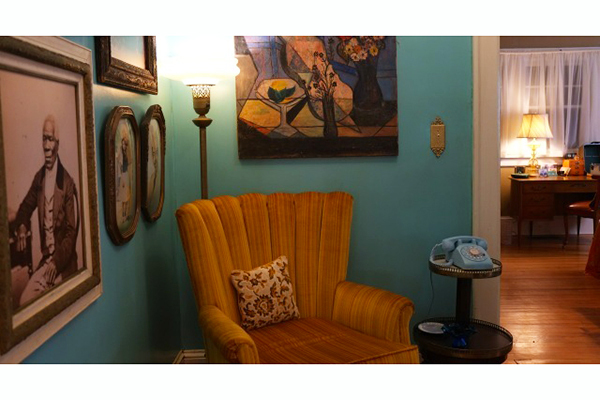 We rented gorgeous antique frames from the Antonio Raimo Gallery as well. Most of that art was from a private collection of outsider art that Julia Heymans found. 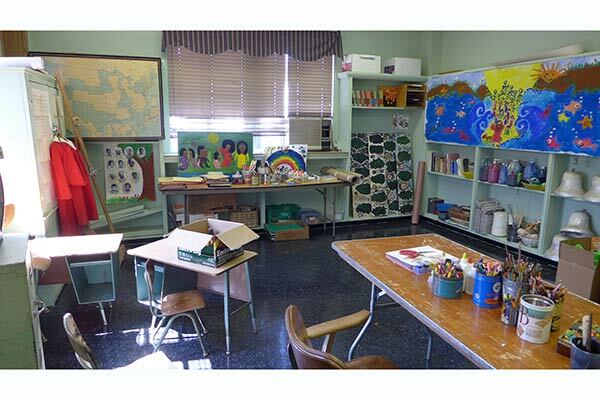 She also contacted several schools and used student art as well as the art from some crewmembers’ kids by organizing several ‘Painting on Saturdays’ gatherings. Mack Café was one of our favorite sets as it represented a local soul food joint that was a hub of the community, ie: lots of photos taped to the wall, framed newspaper articles, local art, announcements, etc. with a classic glass-front candy display near the cash register. 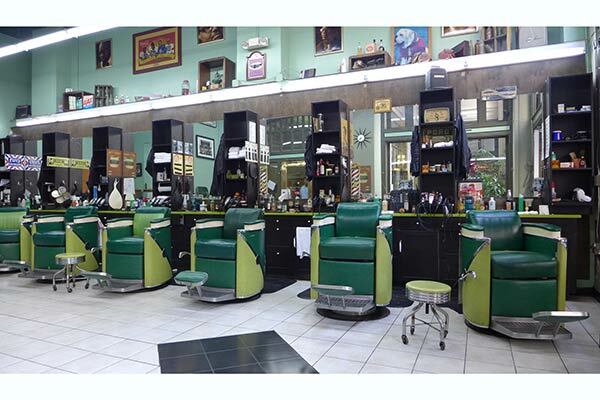 Lots of unmatched chairs and tables, as the owners would have pieced this place together over the years. The art was sourced locally and, again, some of the pieces were from Mark’s grandmother who had been a conceptual artist. 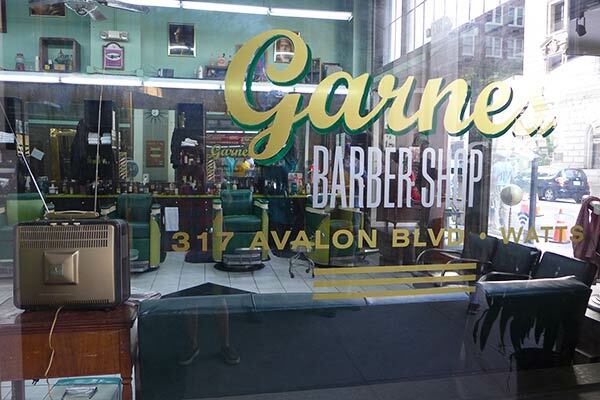 Watt’s Barbershop art came from the Robert Gerwig collection. In general, art clearance was a particular challenge as the company we were using liked to start with a,“NO.” The super-tight schedule, green crew, and punishing heat were also great challenges. EK: They were a poor, humble, proud Selma family and Jimmy’s murder really broke his mother in half. We needed to quickly portray her sadness and vulnerability in a short, cutaway scene. The empty chair on the front porch where Jimmy sat…an empty yard…most people hung out on their front porches…they still do. Old electric meters hung on almost all the front porches at that time. Henry Sanders who plays Cager Lee really broke my heart with his performance. He really nailed that sad southern humility and reverence. SET DECOR: Set decoration for the Edmund Pettus Bridge? EK: That was the original bridge…we removed a present-day sign and played the two sides of the bridge as Selma and Montgomery, creating a little town strip on the Selma side: barber shop, produce store, dry-cleaner and service station. 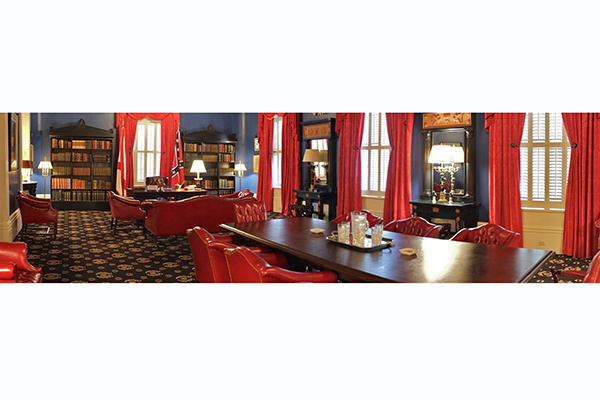 EK: We came across the Governor’s Office at the Alabama State Capitol while scouting in Montgomery and the entire room was blood red with loads of flags and tufted red leather furniture. So we took that influence and applied it to Wallace’s office. 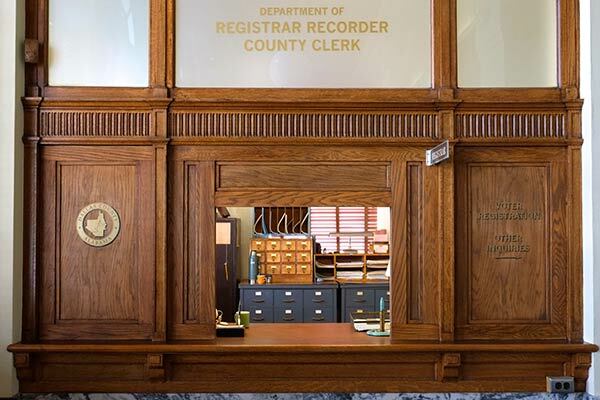 I had an oversized 28” long marble nameplate made for Wallace’s desk that matched an original photo. The sculptor was the same man that carved King’s tombstone. We added lots of portraits of brutal Confederate Generals: Nathan Bedford Forrest, Stonewall Jackson, Bill Anderson, and Patrick Cleburne. EK: We created and shot this set in Covington, GA…we flew a Confederate flag on the courthouse flagpole and the town went nuts. Not in a good way. The Whites Only signs didn’t help either. 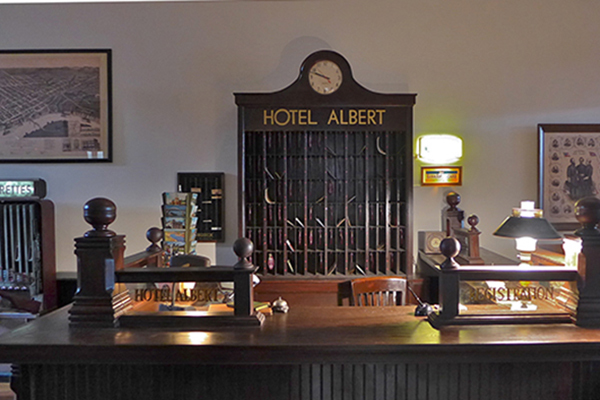 We constructed the hotel lobby interior and a hotel guest room (cut from the final film), within the courthouse. 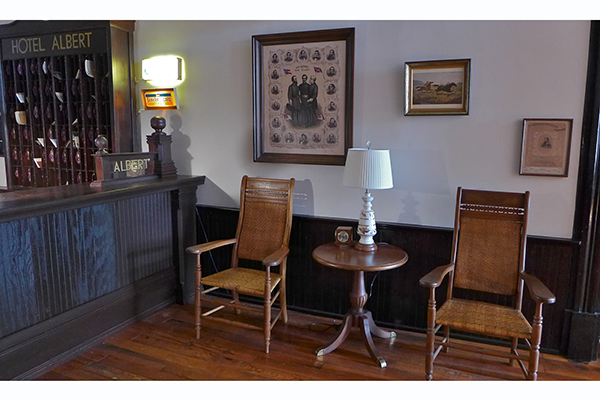 We couldn’t paint anything but we built onto an existing front desk in the main hallway, adding the room-key holder, painted glass, Confederate Army etchings, and tall antique caned arm chairs borrowed from an upstairs courtroom…super southern and designed for hot weather. I had never seen anything like them and thought they’d be perfect. 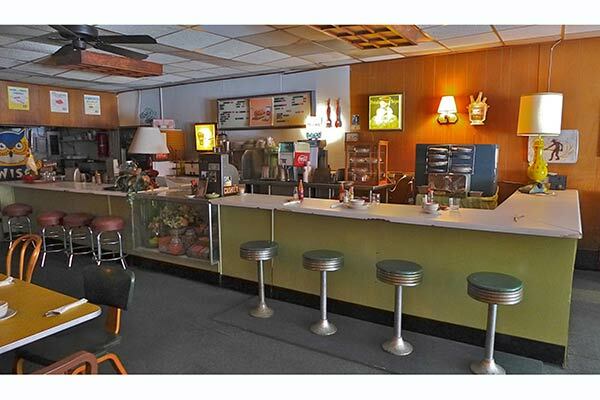 Lots of little touches, like a glass wall case with Chamber of Commerce notices, a Lynchberg Steakhouse menu, vintage Diners Club and Visa illuminated signs, Cigarette machine, fans, a phone booth, etc. helped sell the place as a hotel lobby. SET DECOR: Is there anything we should know about the jail set? EK: That was the first day of shooting. It was the original 1935 jail for the town of Acworth and my guys had a helluva time jamming two antique jail beds into the space so we could block the scene appropriately. When the marchers were actually jailed in 1965, the deputies left the jail pitch black with all the building’s doors open…so the detainees would freeze from the sleet outside. 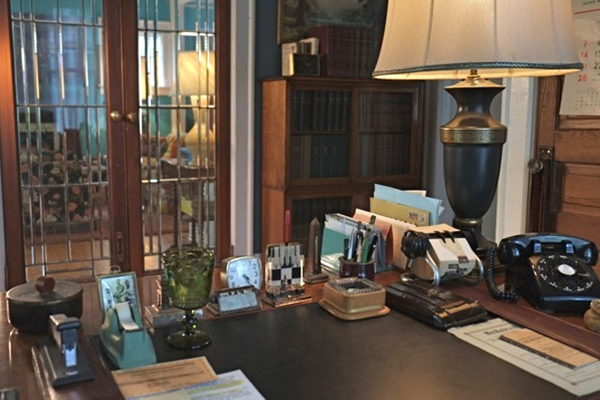 SET DECOR: Anything we should know about the locations? EK: Yes. The podium King gives his final speech from on the steps of the Alabama state capitol is the actual podium from the Dexter Avenue Baptist Church where King preached and started organizing in the basement. That church was two blocks away and they were generous enough to let us use it for that final scene. Another poignant moment was dressing the streets of Selma. We were at on old Rexall drugstore doing window displays. Locals would walk by to chat us up and when we were finally wilting from the heat, I went inside and found a huge freezer bin filled with individual cups of Blue Bell ice cream. We stood outside in a little circle under an awning and probably ate four servings apiece with the accompanying little wooden spoons - sharing a bottle of Coca Cola poured into the little vanilla cups to make mini black cows. It was the simplest thing in the world but so great on that hot and sweaty day…with my sweet, fun guys. SET DECOR: Were you able to bring any crew with you? EK: It was too small a film for that, unfortunately…although Mark flew in two people as additional support for me, which is pretty generous and amazing. We had 4 core dressers and up to 24 people on heavy dress days, 3 buyers, 1 assistant set-dec, and we went through 4 coordinators, the fourth was a godsend, Miss Jessie Pelligrino. SET DECOR: Were you able to source locally? EK: Atlanta was an absolute Mecca for decorating this show. I found some of the best vendors I’ve ever worked with. Great deals were had the farther out we went but the city itself was a gold mine. Bob Meeks, as I mentioned earlier. Robert Gerwig was also a real find. We just loved him and his vintage ephemera collection. He was a real night-owl and we’d email each other at all hours. He really was a huge asset for us. SET DECOR: And from SDSA business members? EK: Absolutely. As I mentioned, we filled a container with dressing from Omega, WB, Faux Library and History for Hire. Robert Greenfield at WB spearheaded the loading of that container and provided the crew doing returns on the back-end…and Allan Songer at Omega was an enormous help. Couldn’t have done the film without his generosity and aid. Speaking of generosity, I’d like to give a special thanks to Set Decorator Cheryl Carasik who mentored me through this film. She was previously engaged and unable to take this on, although it was close to her heart. She would call me every Sunday to check-in and offer advice, and give guidance. I am forever grateful for her candor and selflessness; I aspire to her strength and wisdom. How refreshing it is to have received such graciousness and support considering our business is such a competitive and backbiting one. This is an example for all of us to follow. SET DECOR: What did you bring with you that particularly helped on this film? EK: 15 years as an art director in the advertising business, and as a set decorator in film and television, would help anybody learn to be adept at thinking on their feet and problem-solving…but also having actually been a child in the 60’s, in the South no less, gave me an awareness of the nuance and sensitivity that needed to be communicated visually. SET DECOR: What did you learn from this film experience? EK: I’ve always intellectually known the impact a set can have on an actor, but this time was more profound. More then once during the course of the film, the principal actors, upon viewing the sets, expressed effusive gratitude for the world we had created for them. It was almost overwhelming, and considering the tremendous effort we all were putting into this film, it was very humbling.